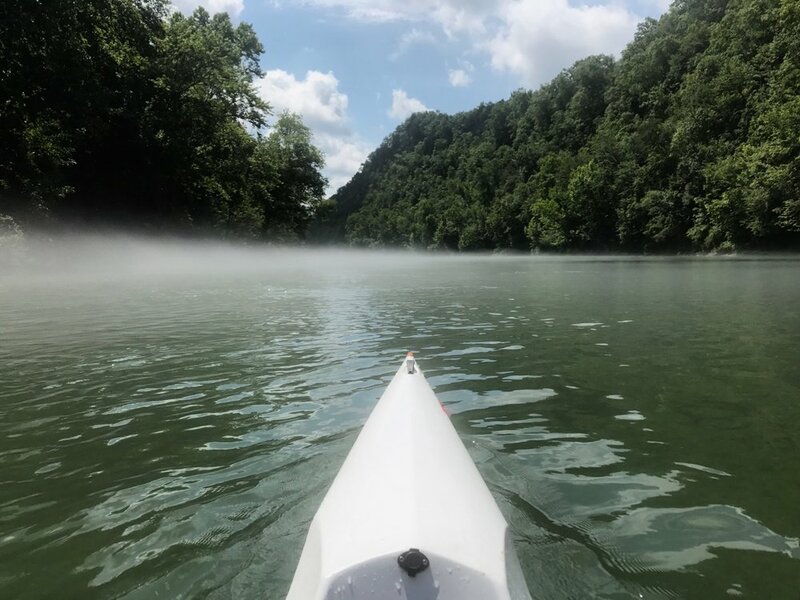 On August 18th, Mutt E Waters River Rentals, The Burkesville - Cumberland County Chamber of Commerce, and Cumberland County Trail Town Committee invite SUP, kayak, and canoe paddlers to participate in the Third Annual Mighty Cumberland River Run. The race venue is second to none for a river race; limestone cliffs extend out, as bald eagles and crystal clear waters are sure to amaze. The river is often shrouded in a beautiful early morning fog and was used extensively, as steamboat's transported goods and services in the rivers early days. As the Mighty Cumberland meanders south you'll be cooled by the always constant year-round river temps in the mid 50's, guaranteed to keep you from getting too hot as you paddle furiously to the finish and almost certain victory. Burkesville is a quiet little river town nestled in the hills of Cumberland County, with plenty of area history, down home country charm and some of the most beautiful scenery, its Kentucky's best kept secret. So leave your troubles behind and get your race on, at the Cumberland River Festivus and The Mighty Cumberland River Run.